Former Chilean President Augusto Pinochet has been taken to hospital after suffering a stroke, doctors say. "His vital signs are stable, and he has made a partial and conscious recovery," a statement from the Santiago hospital said. He is to remain in hospital. Judge Juan Guzman ruled on Monday that the former leader was fit to stand trial on alleged human rights abuses during his 17 years of military rule. His lawyers are contesting the ruling and a verdict is due on Monday. Human rights lawyers reacted cynically to the latest development, suggesting the timing was tactical. One of them, Juan Pavin, said it was part of a medical strategy often used by the general. "When there isn't a court decision nothing happens," the lawyer told the BBC. 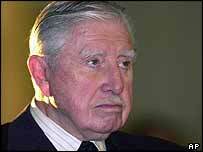 Gen Pinochet, 89, arrived at the hospital shortly before 1300 GMT, said his spokesman, retired Gen Guillermo Garin. He told reporters that the former military ruler had been taken to hospital after feeling bad during breakfast. The stroke has left Gen Pinochet with "impaired mobility and a neurological deficiency," Dr Lionel Gomez Serey said in a statement. "He will remain hospitalised for tests, depending on his progress," the doctor said. Gen Pinochet faces charges relating to the murder of one Chilean and the disappearance of nine others as part of Operation Condor - a conspiracy by six South American regimes in the 1970s to hunt down and kill their left-wing opponents. Earlier this month, a court ruled that Gen Pinochet could face charges over the murder of his predecessor as army chief, Gen Carlos Prats, who died in a car bomb attack in Buenos Aires in 1974. Gen Pinochet is also being investigated over tax fraud and money laundering. The Supreme Court only decided to strip the former leader of immunity from prosecution in August. But so far the state of his mental health has prevented him from standing trial. A previous investigation, accusing him of responsibility for the deaths of more than 70 political prisoners, fell through in 2001 when an appeal court found that he was too unwell to be tried. He has previously been diagnosed with "moderate dementia", while doctors have disagreed over whether or not he is fit for trial. He also has diabetes, arthritis and uses a pacemaker. A Chilean inquiry concluded that more than 3,000 people were killed for political reasons during Gen Pinochet's rule, while more than 30,000 Chileans have testified that they were tortured or detained by the military government.